“The sunny terrace of paradise” – is how the author Peter Rosegger described Ramsau am Dachstein. The hospitality at the Alpengasthof Peter Rosegger is inspired by the ideas of the famous author. 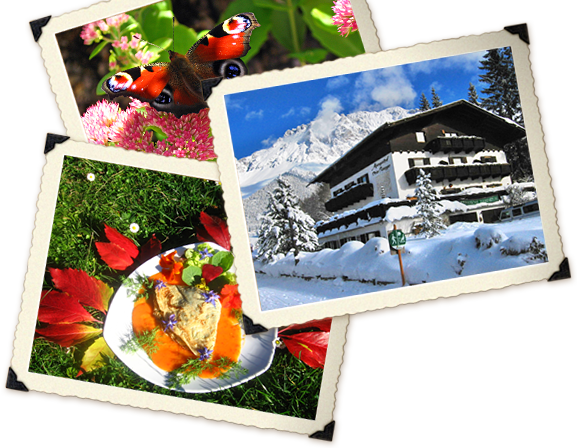 Here in this beautiful resort place at our Alpengasthof you‘ll forget the everyday. We have opend from 29. May 2019 for our summer-season. where man as global citizen finds his refuge." In this spirit we are keen to do our utmost to ensure our guests feel at home, cared for and pampered. Savour the excellent, healthy cuisine from our exquisite kitchen and relax in cosy surroundings and enjoy a jolly atmosphere of an evening.